President Donald Trump signed a series of executive orders Tuesday to advance the Keystone XL and Dakota Access Pipelines. Trump signed a total of five orders regarding environmental issues in the Oval Office, including a pair addressing the pipeline projects as well as actions to expedite environmental reviews for high priority projects. "The regulatory process in this country has become a tangled up mess," Trump said. Trump added that his actions on the Keystone and Dakota Access projects would be subject to terms and conditions being negotiated by the United States. He also told reporters gathered in the Oval Office that if a pipeline is built in the United States, the pipe material should also be built domestically. Energy Transfer Partners, the Dallas-based company funding the $3.7 billion project, did not respond to repeated requests for comment on the president's executive order. The decision has angered environmental advocates who say that the projects would have severe negative impacts on the areas where they are built and would encourage more reliance on fossil fuels. The Standing Rock Sioux tribe and its allies have vigorously protested the Dakota Access project, saying it would damage cultural sites. Standing Rock Sioux Chairman Dave Archambault II told NBC News that the tribe would take immediate legal action to fight the executive order. 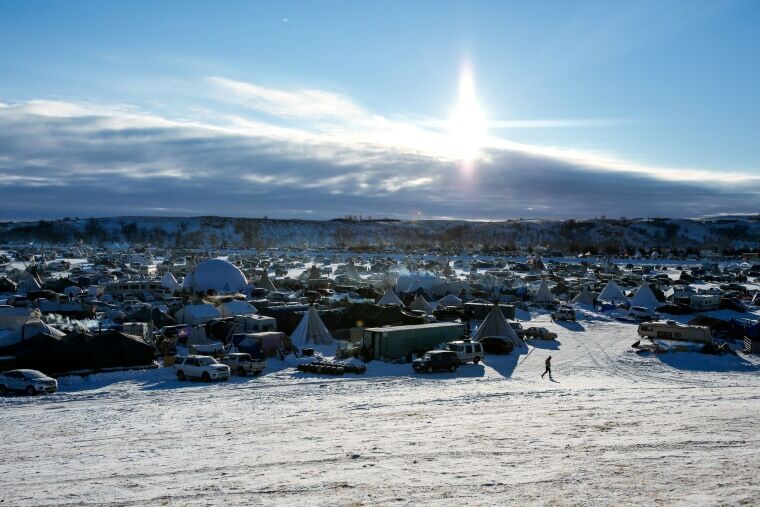 In a statement, Greenpeace executive director Annie Leonard pledged that the same group of environmentalists, Native American activists and farmers that successfully stalled the projects in the past will continue to fight their advancement. Backers of the pipelines say they will create jobs and cut energy costs. During a meeting with auto executives earlier Tuesday, Trump described himself as "an environmentalist" but argued that federal regulatory and permitting processes are too drawn out. "I am, to a large extent, an environmentalist," he said. "I believe in it, but it’s out of control and we’re going to make a very short process and we’re going to either give you your permits or we’re not going to give you your permits, but you’re going to know very quickly." The Obama administration rejected the Keystone XL pipeline in November 2015, and it denied a permit for the Dakota Access project late last year. Carrie Dann and Daniel A. Medina contributed.